I find it interesting how a palate changes over time. I remember when I used to drink primarily wine, I transitioned from big dry reds to the crisp dry whites. I still enjoy both, but beer has taken the top shelf in refrigerator, and my palate for that is continually evolving. There was a time where Molson Canadian was the best beer ever which was slowly replaced by craft amber lagers and ales. Eventually I became super hop crazy and tried to murder my taste buds with the hoppiest and biggest beers I could find. Stouts? Porters? Nope. I drink my coffee in the morning and not with my beer. That’s starting to change again. 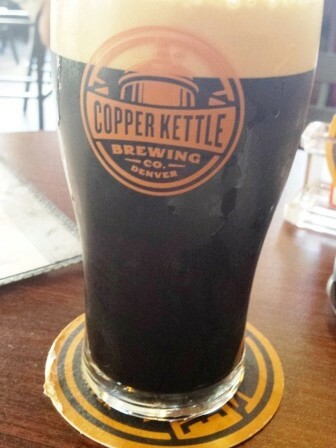 Last week I had some time to kill before picking up Loriana at the airport in Denver, so I stopped by Copper Kettle Brewing off of South Valentia Street. Copper Kettle is in a little strip mall type building and has a small tasting room along with an outdoor patio .A food truck was saddled up on the sidewalk and it being a Friday afternoon, the tasting room was bustling. I grabbed a two top and ordered up a Basil Cherry Blonde and took in the atmosphere. As the first beer drew down I decided I needed to try their milk stout. I’ve been taking a liking more and more to stouts, and when I saw they had theirs on nitro it convinced me even more that I needed to try it. I don’t rate many beers as a five on Untappd, but this one made the list. First off, nitro beers are the best. The creamy mouth feel and smoothness makes for a fantastic mouth experience. Milk Stouts are usually already fairly smooth thanks to the brewing process with the lactose, add nitro to it and you’ve got smooth beyond your wildest imagination. Pair that smoothness with deep dark chocolate flavors and it is one of the best things you can put in a glass. Now I couldn’t drink four or five of these, but as a punctuation on a visit to a great tasting room, it was perfect. The great thing about an expanding palate is the change in attitude while looking at a beer list. My stop in to Copper Kettle a year ago would have meant trying the IPA and Pale Ale. This time I went fruit and then stout. I’m glad I did.